It is absolutely ridiculous for President Jonathan to think Alison-Madueke remains the right choice to steer the affairs of the ministry of petroleum resources and only Jonathan thinks so. Nigeria was rated the second most corrupt country in the world by the latest Gallup Poll no thanks to Denziani Alison-Madueke’s leadership of the petroleum ministry that has been shrouded in monumental corruption. According to the Ribadu report that the Presidency is now trying so hard to discredit, Nigeria’s long history of corruption in the oil sector continued with billions of dollars in signature bonuses paid by oil companies to the federation missing and to think of the list of unresolved oil scams such as the Halliburton, Siemens, Wilbros, Panalpina and A.G Daimler scandals, the Nigerian bribe takers as usual are walking scot free, mingling, wining and dining in Nigeria’s corridors of power while the United States, France, Italy, Switzerland and Germany have long punished companies and individuals involved in handing bribes to Nigerians. From the false and jumbled dates of graduation and work experience in her CV to the arbitrary awards of crude lifting contracts to “brief case” companies, fraudulent assignment of prospective rights in five lucrative oil blocks to two barely established companies and extortion of bribes from marketers there have been calls from Nigerians for Alison Madueke’s sack or honourable resignation not because “she is guilty” but because “from the series of revelations coming from the probe, she is not innocent.” Its been one fraud after another, her continued presence in the cabinet makes a mockery of President Jonathan’s fight against corruption. From the outset, she has always generated controversy. Needless it was to lie but she deceived Nigerians when she backdated her year of graduation from Howard University from 1992 to 1987 to connote she had work experience, giving the impression she skipped national youth service on her return to the country. She was actually 32years upon graduation in 1992 and hence the national youth service exemption rule applied to her. Obviously this must have misled Shell into giving her an appointment back then and subsequently as a minister of the federal republic of Nigeria. “What she has done is perjury. It is criminal and punishable by law and such a person is not fit to hold public office.” Said an official of NNPC at that time. She equally misled the Senate and the Nation during her ministerial appointment. It was a fraudulent representation, a criminal offence punishable by law. As the Minister of Transport in 2007, she shed crocodile tears at the sight of the deplorable Benin-Shagamu expressway promising to rehabilitate it. It turned out to be business as usual as she payed N30.9billion to contractors between 26 and 31 December of the same year for doing nothing as the road remained in the same deplorable state she met it. The Senate, in October 2009, probed the questionable spending of N300bn in the transport sector, Alison-Madueke was the only serving minister among five former ministers of state and four permanent secretaries indicted and recommended for prosecution. Vanguard newspapers also reported she allegedly transferred N1.2bn into the private account of a toll company without due process and in breach of concession agreement. 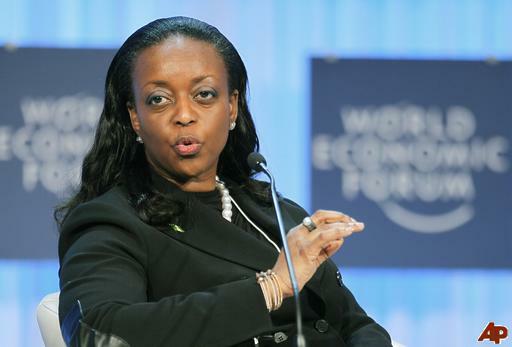 As the minister of mines and steel development, the moribund Next newspaper investigation brought her impropriety to the public for the umpteenth time, exposing her under-arm dealings with US-based jeweller Chris Aire who out of the blues boycotted due process to register and gain approval pronto for his two brief case companies to lift Nigeria’s sweet crude. As usual no charges were filed and the allegations were considered false. A more serious allegation in 2010 was the KPMG report on the “process and forensic review” of NNPC which opened a pandora’s box of stunning verdict on every aspect of the oil industry. Regrettably, in a calculated attempt to truncate the investigation NNPC process owners’, by extension the petroleum ministry, refused to provide “supporting documents”. The KPMG report was considered inconclusive in critical areas such as issue and renewal of importation supply contracts, evaluation of petroleum products importation bids, criteria for allocation of products and volumes to importers, and pre-qualification of approved importers. Another demonstration of President Jonathan Administration’s resolve to thread softly with corrupt cases and dine with a short spoon with such individuals is the poor handling of the N155billion Malabu Oil scam as Mrs Alison-Madueke continue to play hanky panky with sensitive documents needed for full scale investigation into the case by the House of Representatives committee set up to probe the oil scam. On October 4, 2012, hardly had the committee began its public hearing than it noticed the conspicuous absence of Alison-Madueke and Bello Adoke, minister of Justice. Sources privy to the investigation said “there is high-level complicity in the deal and there is therefore high-level cover up”. Investigation by the EFCC clearly established that Mr. Etete’s Malabu only served as a money laundering machine, as substantial parts of the funds was later transferred to various accounts owned by “real and artificial persons”. An eye popping scam perpetrated under the Minister’s watchful eyes was the award of N1.1bn contract to a contractor for the supply of a dive support sea-going vessel to the Federal Government-owned Petroleum Training Institute, PTI, Effurun, in Delta State, which was never supplied. Top officials of the Federal Ministry of Petroleum Resources were said to have conspired with a contractor in the scam . In-spite of her numerous sins, the President deemed it appropriate to leave her in office making a mockery of his touted fight against corruption as other ministers in the cabinet at different point in time have been eased out but the most controversial, maligned, criticized, indicted but never found guilty and beloved minister of the Presidency, Denziani Alison-Madueke has remained untouchable. Her immortality and invincibility is gob-smacking and obfuscating. It is absolutely ridiculous for President Jonathan to think Alison-Madueke remains the right choice to steer the affairs of the ministry of petroleum resources and only Jonathan thinks so. NO TRUTH IN THIS MANS WRITE UP.ALL NIGERIANS KNOWS THAT IT WAS TONY ANINIAH THAT EMBEZZLED ALL THE FUND FOR ROAD MAINTENANCE IN WORKS MINISTRY LEAVING NOTHING FOR MADAM TO WORK WITH WHEN SHE BECAME MINISTER OF WORKS AFTER OBASANJO ADMINISTRATION.THE SENATE AND HOUSE OF REPS ARE STILL QUESTION TONY ANINIAH OF THAT N300BILLION. ASK YOUR SELF WHAT THE HOUSAS AND THE YORUBAS(MY PEOPLE) WHO HAS BEEN DOMINATING THAT MINISTRY BEEN DOING ALL THIS WHILE AND NIGERIAN HAS STILL NOT BEEN TRANSFORMED.ALL THE OIL BLOCKS IN THE SS OFFSHORE HAS ALL BEEN GIVEN OUT TO THE EMIRS AND THE SO CALLED GENERALS OF NORTHERN EXTRAC.THAT IS THE SIMPLE CLAMOR FOR ONSHORE OFFSHORE DICHOTOMY.PLEASE ALLOW THE OWNERS OF THE RESOURCES TO HAVE A FAIR SHEAR OF THEIR RESOURCES.WHAT IS NIGERIA GAINING FROM THE NORTH OR WEST? ONLY BOKO HARAM,SHARIA LAW, IGNORANTLY QUEST FOR POWER JUST TO LOOT THE COUNTRY TREASURY AND MARRY TEN VIRGINS.BUT YOU WOUNT CRITISE THOSE ONLY TO FAKE ALLEGATIONS HERE FOR NIGERIANS.SORRY OH ,WE EDUCATED AND MORE CURRENT TO CAUSE OF EVENTS THAN YOU DO.RECOVER ALL THE ABACHA,IBB,ABDULSALAM,UMARU DIKO,DANGOTE`S LOOT(Nigerian stock exchange) beofre you can be qualified to point any accussing finger on any southerner not to talk of a mother of Diezianes status.